The money shot says it all. This appetizer is a keeper. 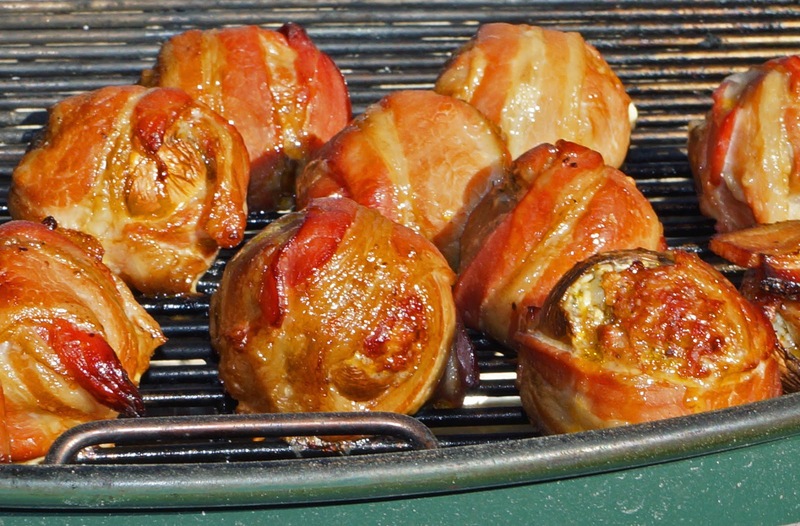 Bacon wrapped mushrooms stuffed with cream cheese and spicy sausage has all the right moves for a very fine snack prepared on the barbeque. The preparation is a little involved but the results are stellar.We will provide a basic guideline on how to prepare these wonderful treats. Feel free to add or subtract ingredients to create your own version of stuffed mushrooms. Just do not forget the bacon. The first step is to procure a dozen medium large mushrooms. Wipe any yuck off with a paper towel. Twist out the stem and use a spoon to hollow and remove the gills. Next use some softened or whipped cream cheese. I have used flavored cream cheese with great results. Today we have taken one six ounce package of cream cheese and divided it equally among our mushrooms. It is spread on the bottom of our hollowed out mushrooms to form a base to cradle our sausage. We used Jimmy Dean's sausage spiked with garlic and spicy rub but you can let your imagination go wild with your sausage choice. 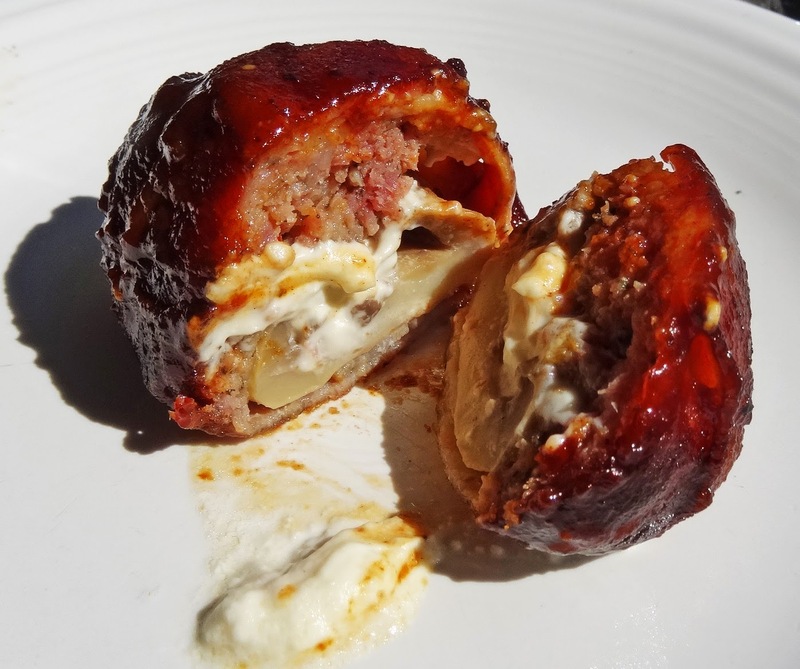 We rolled the sausage into little balls and placed them on the cream cheese. Everyday supermarket bacon will be our wrapper. Take one slice and cut in half. Arrange the two halves into a cross. Invert your stuffed mushroom and place onto bacon cross sausage side down Stretch and fold each section of bacon to top of mushroom (bottom) and secure with toothpick. It is time to build a fire. We are using an indirect fire on our Weber Kettle. 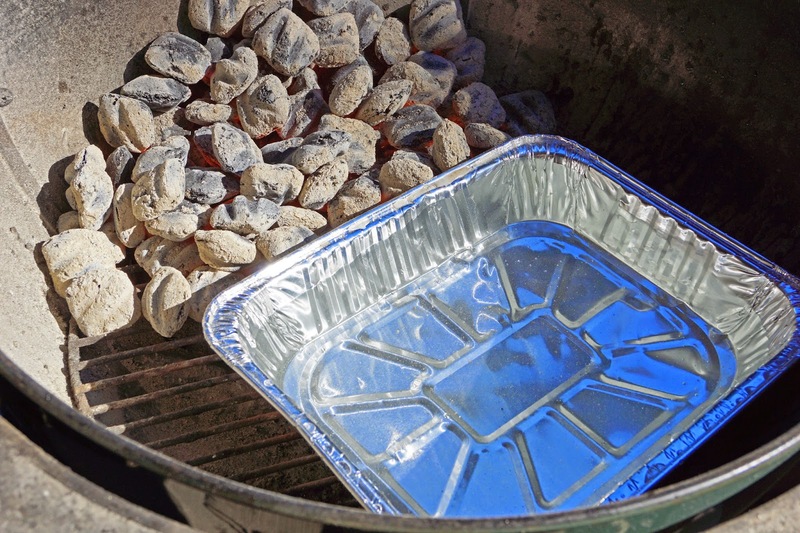 You will notice the charcoal is on one side and an aluminum pan filled with water on the other. We also place several chunks of hickory wood on the lit coals to add a smoke component. Place your bacon balls toothpick side down on the well oiled grill over the water pan. Place top on grill and be sure all the vents are wide open. Cook for approximately 40 minutes or until the bacon is crisp. We also checked the sausage temperature with a probe thermometer. (160 degrees). Remove sausage from grill into a holding pan. We now dip our balls into a barbeque sauce of your choice. It is time to remove the toothpick. Use caution when handling your balls because they are hot and fragile Return the stuffed mushrooms to the grill for an additonal three minutes. Just enough time to set the sauce. Remove them again and be prepared to have a treat. You do not have to let them rest but I would highly recommend it. If you bite into these treats right off the grill you will experiences a rush of molten cheese.. Once they have sat for 10 minutes or so they will firm up slightly. This appetizer is a winner. Have fun. greatwhite hunter, Meat Adventure Wednesday. Look out Angelo here we come. Big Dude, Thanks, I am get requests to bring make more. Have this scheduled to post on twitter this afternoon, this is too good not to share. Chris, Thanks. I get requests to make them all the time now. The Head Pig, They are pretty filling but I think I could do a dozen.